This park looks great. The landscaping is nice however, behind the facade there are many permanent residents in run down RVs that could never move. It's more like a homeless camp than a regular resort. Despite this image, the facilities are good. Clean laundry and rest rooms. Be careful not to talk politics. Conservatives are not welcome. We've stayed here for a month the last 5 years, but never again. They no longer offer monthly discounts for mid summer, and even though we had reservations 1 year in advance, they called us just 3 weeks before our reservation to inform us that we would not be getting the site we had reserved. And, we would be paying over twice that monthly as have in the past. With that said, we have stayed at over 250 different campgrounds over the last 5 years, and this is the noisiest of any where we have stayed. It's the only place we have ever experienced theft, and actually feel the need to lock everything up and cable our BBQ. They call themselves a resort, but even though they used to have a putting green, a weight room, used to let you wash your rigs, they have taken all of that away. So they offer less and charge more, perfect. Other than that, utilities are good and Verizon is strong and it is handy if you have to be in Grant's Pass. We are not the only people they have pulled this stunt on so beware. Never again. The roads are easy for big rigs, sites are pretty level, trees are not really an issue for slides, sprinklers are not adjusted that well, so beware of overspray. No one is a site camp host, so once the office closes there is nobody to turn to if there are problems. Close to many eateries and pubs, pretty easy off & on the freeway. We stayed 2 nights for a RV maintenance appointment. The park is close to I-5 (Exit 58) but requires negotiating busy multi lane business district streets with turns onto narrow side streets to reach the park. The park is small but appears to be well cared for with manicured landscaping. The interior roads are paved. The interior roads and turns are sufficient to maneuver larger RV’s. The sites are a mixture of back-ins and pull thrus. The parking pads are concrete. The P/T sites were long enough to say connected to a toad. While the sites were narrow, there was sufficient room for opening slides. The park was built on a sloping hill but there was an effort to tier the sites so the park seems to understand the simple concept of the importance of a flat, level site as the sites were generally level and flat. The back in sites along the outer edge appeared be extended stay sites. Distance and grassy areas establish privacy between the sites. They have full hook ups – water, electricity (50/30/20 AMP), & sewer. The utility connections were towards the middle to back of the sites. The sewer connection was at the ground so it was easy to establish a downhill flow. Most all sites had an outside table. Some sites had a metal pedestal for BBQ grills but there were no fire pits. There were quite a few trees scattered throughout the park and around the perimeter so satellite reception would be dependent upon your site. The park information listed 24 channels but didn’t mention anything about broadcast channels. Didn’t try to get any broadcast channels. We had made reservations so a registration packet was attached to the office door. But it didn’t contain any access codes for the bathrooms, laundry room or WIFI so we were unable to connect. Our Verizon WiFi hotspot worked well. So did our NET10 cell phone. There was one small designated partially fenced pet area located in a corner of the park. The area was basically a gravel staircase that opened onto an adjacent road. As it turned out, the road was private property that was not owned by the RV property owner. Don’t remember seeing any bag dispensers/collection stations for waste. There was sufficient area to walk dogs along the park’s roads and dumpsters for waste. We would probably stay here again if the need arose to stay in the area. TIP: Office was closed on Sunday so no access to codes for the facilities or WIFI. Best time to contact the office was between 9 AM and Noon. We have stayed at Jack's Landing a number of times over the last couple of years. 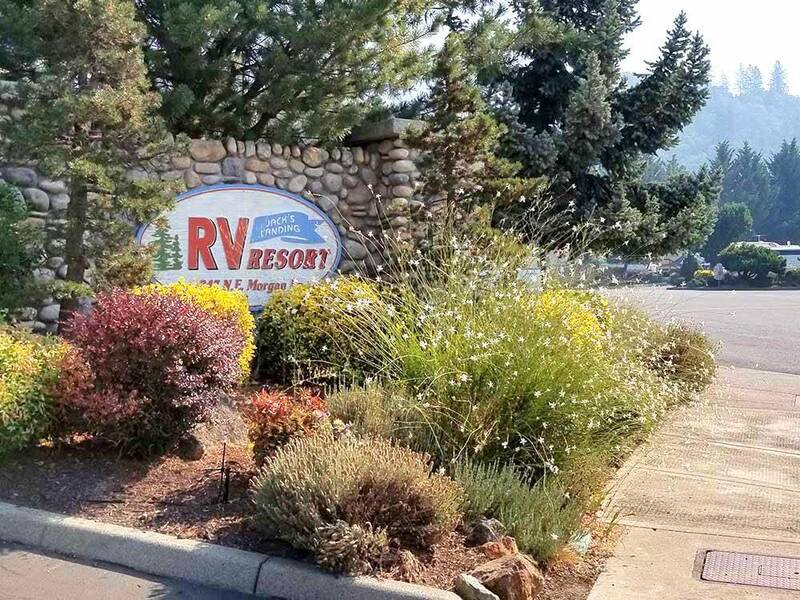 The facility is very nice, well maintained, and a convenient place to stay for business or other activities in Grants Pass. 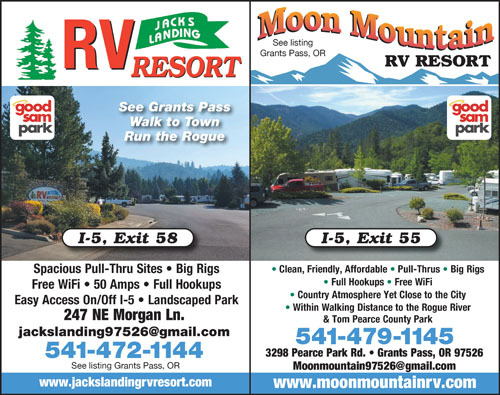 Unfortunately, the management (the lady who answers the phone at times, runs the office, and claims to be the HR Director) of the RV park is abrupt, not friendly nor accommodating. The on-site host is always friendly, helpful, and accommodating...in other words, the opposite of the 'senior management'. Our most recent stay was in May, 2016 for healthcare reasons. The healthcare appointment was taking a little bit longer than we had thought. Out of courtesy, we called the RV park at 11:20am to advise them that we might not be out by noon (check out time) but would be out no later than 12:30pm. Rather than thank us for the proactive heads up, the female HR Director/Office Manager was hostile, abrupt, and threatened to have our trailer moved if we were not out by noon. We abbreviated our healthcare visit and got back to Jack's Landing, hooked up and were off their premises by 12:06pm. As we left, I stopped at the office to tell her that we were out. The office was closed until 2pm! It is very unlikely that we will ever stay at Jack's Landing again, at least not until the ownership changes, or changes their attitude towards their customers.